Route 66, the Mother Road of the USA. This concrete leviathan of a road stretches 2,448 miles across of America – starting in Chicago and ending in Los Angeles. Around 80% of the original route is still drivable, and people have been known to undertake the adventure of traveling the whole stretch (recently English comedian Billy Connolly completed route 66 on a motorbike). Route 66 is known as ‘the ribbon which tied the nation together – America’s main street’ and many American citizens hold tender stories which began and ended on Route 66. Contained within this article is all you need to know about Route 66. Route 66 was forged by the needs of a rapidly changing USA. 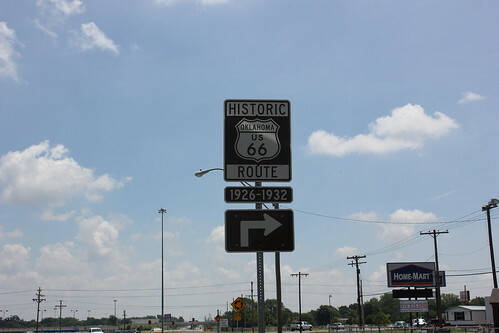 Unlike the other highways, route 66 had a mind of its own – not sticking to a straight course through the United States. The reason for this is that rural farmers needed a point of access to transport grain, making the road actually diagonal. Route 66 is a highway which has its roots in trucking, for trucks began distributing goods around America on this famous road in the early 1900s. During the depression, thousands upon thousands of young males from pretty much every state went to work upon route 66 as laborers in effort to finish it. Along the Route, there are a plethora of different places – all of which have strong roots in the road’s history…here are a couple of highlights. 66 Drive in Theatre – Because every motorway/highway should have one! Drive in to the cinema American style, chill out in the comfort of your own automobile and enjoy the film. The concession stands sells a variety of different hot dogs and BBQ sandwiches AND you get two films for the price of one (two in a row!). What’s not to like?! Find this little gem in Missouri. Ice Cave & Bandera Volcano – If the concrete paradise is getting a bit too much for you, visit New Mexico’s Land of Fire and Ice. Follow an ancient lava trail through the forest of pine, fir and juniper trees into a beautiful ice cave. Volcano Bandera erupted 10,000 years ago, and is known for being one of the most accessible volcanoes in the states. The ice cave is immersed in blue-green beauty from the sunlight shining through the ice – never rising above 31 degrees Fahrenheit. 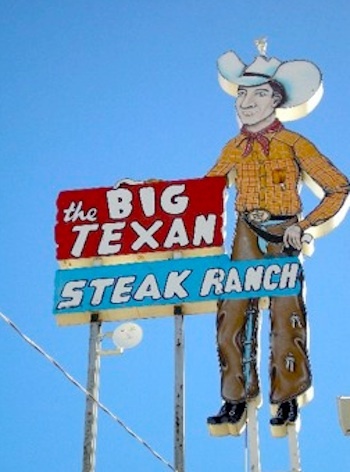 Big Texan Steak Ranch – This bad-boy cowboy has enticed journeymen off route 66 since its birth during the mid-1900s. Rumor has it that if you can eat an extraordinary amount of food (72” steak, baked potato, salad, roll & shrimp cocktail) in under an hour – it’s on the house! However, after eating that ridiculous amount of food you’ll have to get a bigger car to support your weight! An 11 year old boy and a 69 year old grandmother are two of the 10,000 to have managed the feat successfully. Meteor City – It would be a sin for any sci-fi nerds out there to drive along route 66 and not stop at Meteor City, the biggest meteor crater in the USA. Apparently the asteroid which hit Earth was traveling at 26,000 miles per hour – around 50,000 years ago. Being a celebrity highway has worked to route 66’s advantage over the past years, and has managed to work its concrete charm into different forms of media. Cars (film) – This animated film from Pixar is based upon route 66. Whilst ‘Radiator Springs’ (which is featured in the movie) does not actually exist; Pixar claims that many of the places shown in the film are based upon real places. The King of Route 66 (arcade game) – If you ever found yourself wound up in a service station on the M1 motorway, you probably would have encountered this dusty legend of a video game tucked away in a shady corner. Many places featured on the game are taken directly from the route itself. In conclusion, traveling the length of route 66 is a pilgrimage which all people should take at some point in their lives. This article has simply touched on a few places, hopefully to stimulate your curious nature into taking the big trip yourself, leading you to create your own stories and adventures – like many have done in the past. Many thanks to Sixt.co.uk for their help with putting together this historic road guide; get exploring Route 66 today! I’ve heard a lot about route 66. It’s good to read its history. We traveled on route 66 years ago! So much fun! My cousins just finished a Route 66 drive – it was on their bucket list. Great post.